Our Blog Where did the day go? Amidst many of the people development projects I get involved with, I am often met with the phrase “I don’t have time to do my job”. I know this problem reaches way beyond the people I see face to face, so thought I would share with you some of the insights gained from working with busy professionals with you, as they may well help you too. We know you are busy…so here are 3 things I’ve found work really well. 1. PLAN WITH MORE THAN A LIST. ‘Planning’ sounds really easy, but we do not often see people planning their work week realistically. 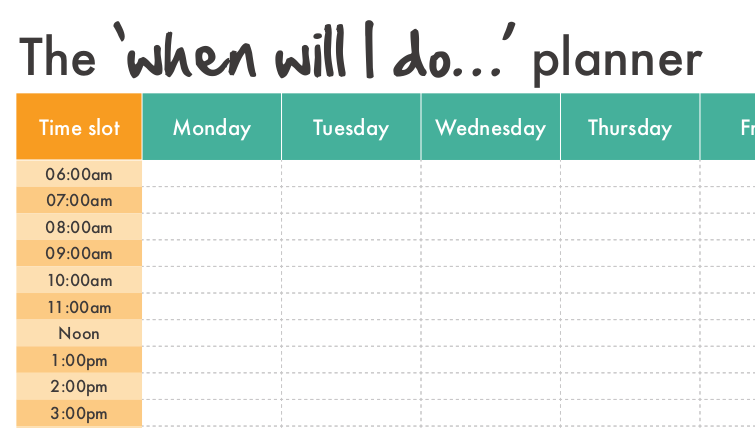 That’s why we devised the ‘When will I do it’ planner that you can download by clicking on the button below. It forces you to think about what you need to do and when you will do it in more detail than a to do list. It also has some handy questions on it to help you plan effectively and then reflect on the week. Make sure you allow contingencies for the things you know will happen – you will get calls; you will be asked to do some last minute tasks from others. These are not irritants – they are (more than likely) part of your job. If you are managing others, you can use the planner to help them meet the objectives and targets you have agreed with them. 2. Aim to ONLY DO WHAT ONLY YOU CAN DO. This is often easier said than done but I love this phrase (I don’t know who said it originally, but it’s great) as it forces you to question EVERYTHING and ask yourself ‘should I be doing this?’ ‘Can I pass it to someone else?’ I have found this to be really effective as a tool to question my choices. “Am I REALLY the only person who can do this?” This can mean home jobs too or looking beyond your own organisation, for example to the broader project team. 3. A STITCH IN TIME…. Right now, just pick 2 things that, if you spent time on them now, would save you time in the long run. We all know the sorts of things I mean. Here’s a list of small things that make a big difference. Book time in your planner to do these things to save you time in the long run. b. Filing. All filing – Electronic, hard copy, emails….file it, get rid of it and reduce overwhelm. c. Get some decent apps on your phone. My favourite is a scanner app which costs about £3. It turns your phone into a mini-scanner so you can scan and e-mail on the go. d. Take the time to unsubscribe from email lists that you once signed up for but now just fill your in-box.